SAINT PETER, Minn. – The Gustavus women’s basketball team Saturday celebrated Alumnae Day with a dominant defensive performance, beating Concordia 73-36 to improve to 9-8 overall and 6-4 in the MIAC. The Gusties held the Cobbers to single-digit scoring in the first three quarters of the game and allowed the fewest points in a game this season. Justine Lee (Sr., Dawson, Minn.) scored two of her game-high 13 points to start the game and the Gusties never trailed the rest of the way. The home team outscored the Cobbers 14-8 in the first quarter and 19-7 in the second, taking a 33-15 lead into the locker room at halftime. Gustavus continued to increase its lead in the second half with its largest advantage of 37 points at the final buzzer. The Gusties shot 47.2 percent from the floor and limited the Cobbers to 22.8 percent – the lowest mark by an opponent this season. The home bench was used heavily with 12 non-starters seeing time on the court, accounting for 25 points. Paige Richert (So., Comfrey, Minn.) and Kendall Thompson (Sr., Eden Prairie, Minn.) joined Lee as offensive leaders, each totaling 13 points. Richert was one rebound shy of a double-double, leading the Gusties with nine boards. As a team, the Black and Gold outrebounded the Cobbers 41-27. 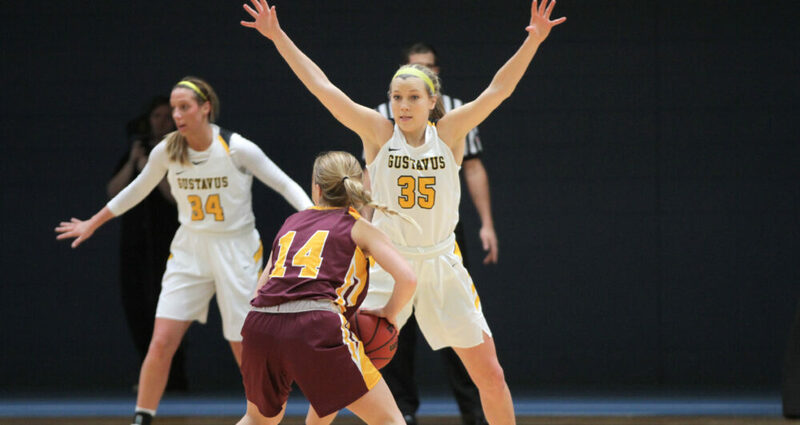 Gustavus next plays at St. Olaf on Wednesday night.